This tool supports the audit of existing services and covers not only the period of time associated with the encounter but also the pre-service and post-service phases of the journey. 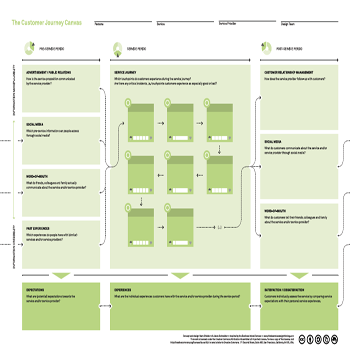 Customer journey maps are typically focused on the front stage encounter from the customer’s point-of-view but as an audit it’d be great to see a complementary version demonstrating the connections with the back stage supporting processes. If you want to try it out without entering your email address, please use our public Customer Journey Demo Canvas for a first impression. Service Design Thinking is an upcoming term that will be (or already is) going viral among businesses. The name is pretty self explanatory—it basically refers to the process of brainstorming and designing services. The Customer Journey Canvas is a template to facilitate this process. The big deal about service design thinking is that it can help a business to stand out from its competitors by offering value-added services that will heighten customer satisfaction and develop brand loyalty. As a consumer, you might have come across both retailers selling the same product at the same price. What makes you patronize one shop over the other? The answer likely lies in the different services offered! As a service provider, a Customer Journey Canvas is a handy tool to have if you want to have an overview of your service processes and generate ideas to refine them. Service Design Thinking spans across the three stages of customer journey: Pre-Service Period, Service Period and Post-Service Period. 1) With social media being an integral part of many people's lives, how can you make use of Facebook, Twitter and other social media platforms to spread awareness about your service? Can your targeted clientele access information about your new service offerings through these channels? 2) Predict what your customers have to say about your service to their families and friends. Market research can provide you a good idea of the various sentiments customers have on similar services or service providers based on their past experiences. This helps you to have a clear overview of the misgivings consumers have about such services and what your business can do differently. This stage concludes with you penning down the likely expectations your customers have towards your service. The mapping of the customer service journey is a major component of the second stage of Service Design Thinking. From the very second your customer steps into the store, he or she will encounter touchpoints (places of interaction between the customer and service) that will contribute to their final evaluation of your service. For example, during a typical grocery trip, the cashier will likely be the last touchpoint of the customer service journey. How the cashier treats the customer will affect the impression the latter have towards the company. Prior to this, there are also other touchpoint which will shape the entire shopping experience. The second stage will culminate in the evaluation of the individual experiences customers have with the provided service. No business can go without reflections and evaluations of their services. How are they being perceived by the customers? Did the service provider follow-up with the customers? After-sales services are particularly powerful because they can impact and influence the customer's perception in a positive way if he or she has a negative impression previously. This is a good opportunity for the service provider to display genuine interest and sincerity in ensuring a pleasant experience for the customer. At this final stage, you will identify the general social media comments customers have about your services. Do they talk negatively or positively about their experiences with the service to people around them? This will lead to the customer's final assessment of his satisfaction level as he made comparisons to his initial expectations.